Preheat oven to 170°C / 160° C fan forced. Baking this cake without the fan is preferable. Grease and line the base of your baking tin with baking paper. Combine the contents of ½ a Noshu packet cake mix, milk, eggs, and melted Nuttelex Lite / butter in a large mixing bowl. Beat with an electric mixer using a whisk attachment on medium speed for 2 minutes. Pour batter into lined cake tin, and cover with foil (leaving room for the cake to rise in the centre). Covering the cake with foil prevents cracking and helps the cake maintain moisture and freshness. Bake for 15-20 minutes, or until a skewer inserted into the cake centre just comes out clean. Allow the cake to cool for 5-10 minutes before removing from the tin and transferring to a wire cooling rack. Allow the cake to cool completely before decorating. Beat room temperature butter/cold Nuttelex Lite in a medium mixing bowl on high speed for 2 minutes until pale and creamy. Add Noshu frosting mix gradually, 1tbsp at a time, beating for an additional 2-3 minutes until the frosting is smooth. If using butter, add milk and beat on high for a further 3-4 minutes until frosting is aerated and doubled in volume. Using a spatula or pallet knife, spread the vanilla frosting evenly across the top of the cake. 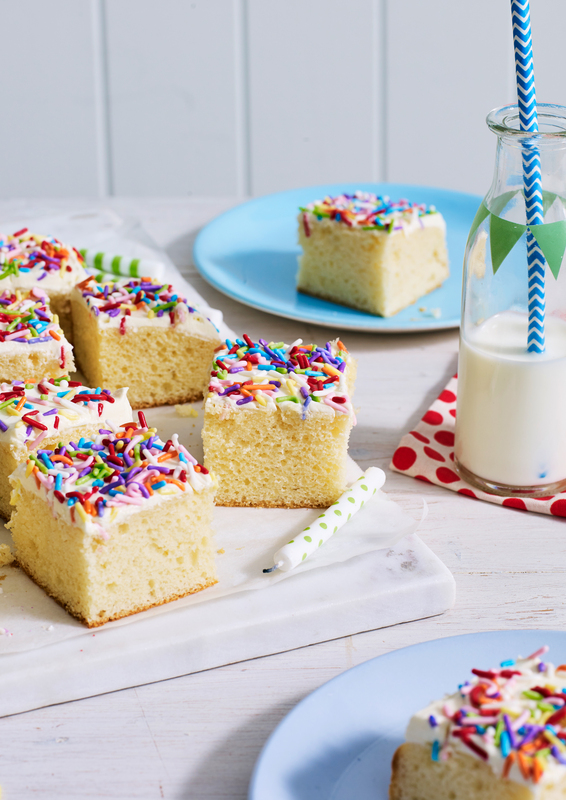 Decorate with sprinkles and slice into 4×4 (16 slices) before serving. Nutritional information per serve (1 slice, when prepared with butter): 118 calories, Fat: 7.9g (4.3g saturated), Carbohydrates: 7.1g (0.2g sugar), Protein: 1.8g, Fibre: 8.3g, Sodium: 186mg.